Aaron Stein (who blogs at TurkeyWonk) and I got together this morning to do a podcast on Turkey’s upcoming local elections. Here you can hear me stuttering, rambling, generalising and self-contradicting in an interesting counterpoint to Aaron’s more incisive observations. The bottom line from our discussion was: don’t expect an AKP rout on March 30. Both Aaron and I predicted AKP will hold Istanbul, and probably Ankara too, and get a share of the vote in the low 40s. Who knows, though? The two photographs above are satellite images that I just pulled off Google Earth showing Istanbul’s historic peninsula. The first was taken on July 24 last year, the second on December 24. Spot the difference. The patch of artificial land that now distends the underside of the peninsula (it is impossible not to liken it to a tumour) is approximately 1.4km long and 500 metres wide. 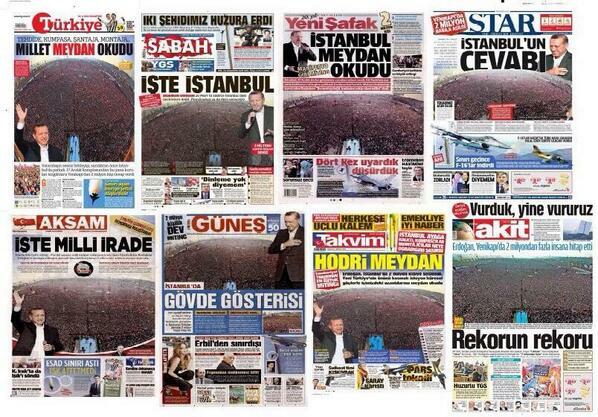 It a shocking visualisation of much that is worrying in today’s Turkey. This bulge of earth that has radically and permanently altered the contours of one of the world’s oldest and greatest cities was not carved out of the Sea of Marmara in the name of profit. In a way, that might almost have been better – or at least less ironic. This 270,000sqm hernia is to function principally as a political rallying ground: a vast arena foisted on the city without meaningful consultation, and intended to demonstrate the democratic mandate of one man. Without having done the research, I would hazard a guess that this later drawing was put about after certain events in late May and June last year, and after which the Government suddenly remembered how keen it was on green spaces. But the point is that we won’t really know what this bulge of land will contain until it’s actually finished. That’s more or less how development goes in Turkey: there is little meaningful public participation or oversight even for projects as monumental in their implications as this. When I first googled ‘Yenikapi rallying ground’ I was surprised to see that one of the entries that came up on the first page was ‘Nazi party rallying grounds’ in Wikipedia. Indeed, state-martialled mass political rallies have rarely been the sign of a healthy democracy. In this case, they’re the sign of one in deep crisis. 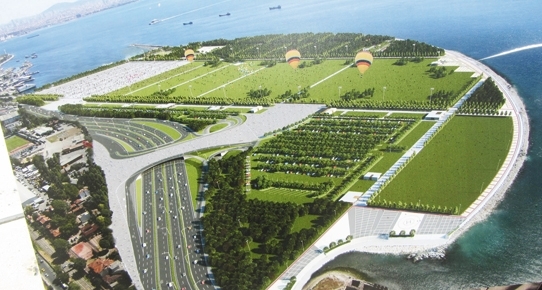 Perhaps at some point in the future this new piece of land will perform a valuable public function beyond the needs of Erdoğan and the AKP: a green space to which people can escape from the crush and the smog of the city, perhaps. 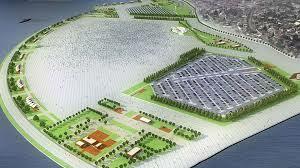 In the grimmest outcome of all, it could end up as a huge shopping mall. Today, however, it is a glaring reflection of a society undergoing a very worrying phase. BTW, I’m researching this topic more. Anyone who has been following the Yenikapi project closely, please feel free to get in touch via Twitter/email (in the about me section). 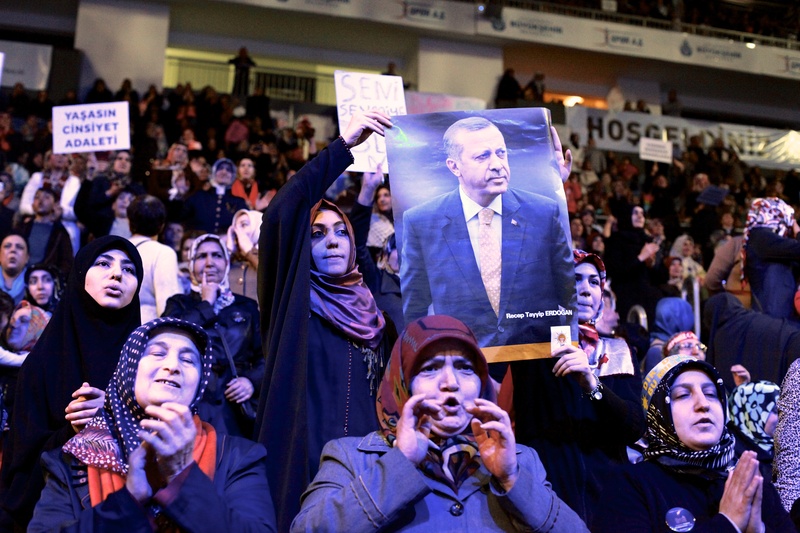 At a rally in Bakırköy last Saturday, members of the all-female audience were whipped up like teenagers at a pop concert long before the main speaker arrived. “Who are we waiting for?” teased the compere. “Recep Tayyip Erdoğan!” they roared in reply. When I asked some of the women what they liked about Turkey’s Prime Minister, most struggled at first to respond, as if his qualities were so numerous that listing them was impossible. “I don’t believe there’s another person on this earth like him, he’s perfect in every way,” said one. The diametrically opposing views were summed up best by a poster held aloft at the Bakırköy rally: Seni bilen hayran, bilmeyen düşman. “Those who know you are your followers, those who don’t are your enemies.” What struck me about this slogan was that it perfectly summed up the strength of the political message Erdoğan is peddling. It is a mantra that encompasses both support and resistance; it presupposes, even requires opposition, while simultaneously dismissing that opposition as illegitimate. People outside of Turkey are often baffled as to why Erdogan retains such a solid core of support in the face of serious corruption allegations that his government has done a fairly poor job of refuting. I think many outsiders – and also many among Turkey’s domestic opposition – do not grasp just how strong his political platform is, and how in the eyes of a significant chunk of the population, his narrative becomes even stronger the more he is seen to be under attack by his ‘enemies’. His message is also shored up by a deep-rooted historical narrative, and tangible achievements in the present that provide rhetorical responses to the corruption allegations that are far more effective in many people’s eyes than substantive ones. The ‘national will’ – a deeply creepy concept to many people – is a far more compelling idea, and less nebulous to many Turks than those such as ‘the separation of powers’ and ‘the rule of law’, particularly when the notion of law itself has been tainted by the motives of the Gülenists. I’m embarrassed to admit that before Saturday, having lived here for four years, I had never been to one of Erdogan’s rallies – though his voice is a constant soundtrack in today’s Turkey. It blares from car radios and television screens in shops, cafes, and groceries across the country. Most TV channels switch coverage to the Prime Minister whenever he speaks. When he took to the stage at Sinan Erdem Sports Hall in Bakırköy, in front of an audience of around 7,000 women, some with young children, one or two with husbands in tow, it was to speak on the occasion of International Women’s Day. The mood was pumped up beforehand by a series of speeches by party grandees, including Istanbul mayor Kadir Topbaş and Families Minister Ayşenür İslam. They spoke about their ‘zero tolerance’ policy to violence against women, about the scores of health centres, sports halls, daycare centres the party has built in Istanbul, and how it will continue to build such things. Opponents of the government view these accomplishments with a jaundiced eye. To them, physical buildings seem insignificant when compared to fundamental rights that are denied or threatened: a woman’s right over her body, in this case, which Erdogan constantly contests with his threats against abortion and oppressive glorification of motherhood. There is a large portion of the population, however – and in general a poorer segment of the population – to whom these concrete achievements are far more substantial than a series of concepts, which, when they do impact their lives (a conservative girl forced to have a backstreet abortion, for instance) tend to be viewed in non-politicized terms, as part of fate, or the will of god, or just the way of the world. During the Gezi protests, as I spoke to dozens of people, one of the few sour notes in what was otherwise the most inspiring and positive social movement I have witnessed in Turkey were the views many expressed about government supporters. “People support AKP because they’ve given them stuff,” was one view I heard often, or “they’ve bought their votes.” AKP supporters were parochial, pious drones, duped by a cynical government, was the general view. As a dismissal of agency, it was on a par with the government’s patronising assertion that Gezi protesters were ‘marginals’, or pampered kids led astray by terror groups. Some people were referring to the popular belief that the AKP buys support through distributing free coal, but also buried in there is the assertion that somehow the material achievements of the AKP – the roads, airports, etc – are electoral bribes. To give an example of why this is such a misconception, consider Tüzköy, a village in Nevşehir blighted by an epidemic of cancer linked to a rare, naturally-occurring mineral in the local rocks. I did a story about this place last year and had meant to blog about it, but then Gezi intervened. Since the 1960s, the Turkish state had known about Tüzköy’s plight (more than 50% of its deaths were caused by a cancer that often struck people in their early 30s). For four decades, nothing was done about it, for a variety of reasons: local politics, weak coalition governments, military coups, the meagre capacity of the state, and so on. It was when an AKP mayor was voted in shortly after Erdoğan took office that the government moved the entire village. The situation wasn’t perfect, but most people I spoke to were very happy about the move. 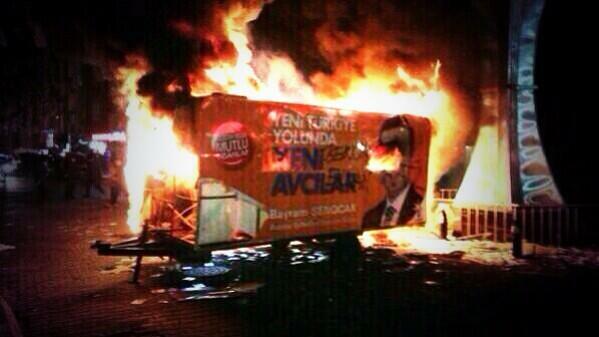 Of course, to AKP opponents, this may be seen as a reward for the mayor’s loyalty. Similarly, government largesse in opposition-controlled areas – such as public transport projects in İzmir – are explained as a political attempt to win support. Perhaps. But that obscures the more important point, which is that the AKP is performing, unlike many of its predecessors, the basic functions of a government. Without drawing attention away from the corruption, lack of consultation, and environmental destruction underlying much of its development, (though the latter issue lacks popular traction in Turkey) the opposition should acknowledge clearly and unequivocally the massive material progress of the last decade, and the AKP’s role in it. Perversely, this may be the only way that such achievements will cease to be perceived by many voters as contingent on the AKP’s being in power. Perhaps in time delivering development and infrastructure would no longer be viewed as a function of political patronage. Anyway, Erdoğan took the stage. He began as he often does, with a sweeping series of greetings to people from across the (Muslim) world. He saluted the suffering women of Syria, Somalia, and Myanmar ‘who have held on to their honour in spite of everything’. He saluted women of every profession and walk of life. Even, in one aside, he saluted ‘those exploited women in the West, who have even been turned into commodities that can be bought’. It was a classic example of the way in which Erdoğan appears to unite, while actually dividing. To his followers, these salutations make him seem like a towering global statesman, welcoming and even pitying those whom he finds distasteful, yet it is also an implicit denunciation of that large portion of Turkish women who have adopted ‘Western’ cultural values. Drawing on the idea that he is facing a coup-like attack, Erdoğan repeatedly seeks to channel the spirit of Prime Minister Adnan Menderes, another charismatic populist who took an authoritarian swerve in his later years and was ultimately deposed in a military coup ın 1960 and hanged. “What they did to Menderes, they want to do to me,” he told the rally in Bakırköy. At a time when people believe Erdogan is fighting for his political survival, he is framing the narrative in such a way that the outcome that one chunk of the population is demanding: that Erdogan leave power and be made to account for his alleged crimes, will be be viewed by another large chunk of the population as tantamount to a coup. Within the opposition, the graft allegations and the government’s response to them – effectively to suspend the rule of law – have created the firm conviction in many people’s minds that Erdoğan is no longer a legitimate Prime Minister. Kemal Kılıçdaroğlu, leader of the main opposition CHP, now refuses to call Erdoğan Başbakan (Prime Minister), and instead calls him Başçalan (Prime Thief). Erdoğan talks as if these local elections will draw a line under the current crisis, but it should be immediately obvious that they will not. His problem is not electoral, but legal legitimacy. The assault by the Gülenists will likely continue and a large chunk of the population will not trust any mandate he claims based on the result, due to the rising perception that given the extent of the government’s alleged corruption and the high stakes (Erdoğan could end up in prison if he ultimately loses power), the elections may be rigged. In the final analysis, these local polls may not be that important at all, other than that they will be the gauge by which Erdoğan decides whether: a) to run for President in August, and b) to hold early general elections. Viewed in the longer term, it is becoming harder and harder to see the situation resolving itself without a far more serious period of social unrest. Whether he stays or goes, Turkey is in for a tough time. While we have seen the anger on the streets of those who feel marginalised by the government’s divisive and authoritarian policies, the other foot has not yet dropped: the anger of the larger proportion of the population who feel the man who delivered Turkey what has ostensibly been a golden decade is being snatched away from them by nefarious forces. * This comment, which I reported in my story in Monday’s Times, has got me in hot water with Turkey’s pro-government press, and resulted in some predictably threatening comments on Twitter, Facebook, etc, some of it based on an unfamiliarity with the function of inverted commas. Moreover, a peculiarly Turkish notion of journalism dictates that it’s irresponsible to report inflammatory viewpoints or events. The righteous indignation of Star, Akşam and others was as much to do with the slightly simplistic leader that ran on the same day suggesting it would be a good thing if Erdoğan ‘lost’ these municipal elections. The reaction to the ‘hanging’ comment in my story and the hostile op-ed was obviously grist to the government’s mill as it tallies perfectly with Erdoğan’s political vision: foreign enemies seeking to topple him, the threat of a Menderes-like fate. In, fact I’m surprised people aren’t accusing me of ‘provocating’ for them, rather than against them.